Relatives of a British-Iranian mother detained without charge in Iran have celebrated her 2-year-old daughter's birthday with a party outside the Iranian Embassy in London. 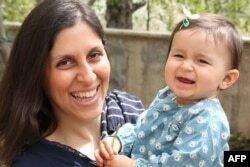 Nazanin Ratcliffe was arrested April 3 at Tehran airport by the Iranian Revolutionary Guard as she tried to return to Britain with her daughter, Gabriella, after visiting family in Iran. Officials also confiscated Gabriella's passport, so she is stuck in the country and being cared for by her grandparents. In Tehran, Gabriella watched her second birthday celebrations unfold via Skype. Her father, Richard Ratcliffe, organized the party for Gabriella's family and friends outside the embassy, where he presented a birthday card with hundreds of signatures. Well-wishers have submitted thousands of birthday cards for Gabriella to Iranian embassies around the world. FILE - Richard Ratcliffe, center, is stepping up the fight to have his wife, Nazanin Ratcliffe, and daughter Gabriella released from Iran. "There's obviously a gentle politics there, which is just to remind the Iranian authorities that they've got a young baby there, and they're keeping her away from her mom with no charges and no justification for two and a bit months. That's just outrageous," Ratcliffe told VOA. He says Gabriella is struggling without contact with her mother or her father. "Obviously, she was very visibly upset at the beginning. So very traumatized, and wouldn't sleep through the night, and kept going to the door, looking for Mommy." Nazanin was detained in solitary confinement for 45 days. She has since been allowed to communicate with her parents, who believe she was moved to another location last week. Her husband says the family in Iran is petrified. "Particularly now I've gone public, there's a higher risk for them certainly, so they're certainly very wary about what they tell me and very wary about the repercussions, not only on Nazanin but also on other members of the family," he said. Nazanin has not been officially charged with any offense, and Iranian authorities have not said why she is being detained. She worked for a charity — the Thomson Reuters Foundation — but was not on business travel, and the company does not operate in Iran. Her husband fears she is caught up in a political tussle. FILE - An undated handout image shows Nazanin Ratcliffe and her daughter, Gabriella. "It's obviously at a time of change in Iran, between those who are trying to build good relations with the West and those who are trying to stop that process. Beyond that, I'm out of my depth." A petition demanding that the British prime minister raise the issue with Iran has gained more than three-quarters of a million signatures, but he has yet to respond. The Ratcliffe family's local member of parliament, Tulip Siddiq, says more should be done. "I think the prime minister should intervene," she said in an interview with VOA. "If we can't protect the interests of a 2-year-old British citizen, then why is the prime minister still here and what is the Foreign Office actually doing?" The British Foreign Office says it is in touch with Iranian authorities but can provide little other information. For Gabriella and her parents, the desperate wait for a family reunion continues.